I think I've officially procastinated myself to the brim with a back log of blog posts. But for accountabilities sake, I commit that I will have a freshly concocted review, dish, etc. up on a weekly basis through the holidays. So while you're all slacking at work and day-dreaming of sugar plums, black friday strategy and new toys, check back in and hopefully I can tell you how to fill your stomach between shopping trips and turkey naps. Also, I needed to make sure I got this one up because as you plan to celebrate with family and friends over the next few weeks, you need to keep this one in mind. 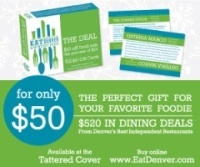 Now I myself was already buttered up by Jen Jasinski's cuisine, having loved all of her other concepts in Denver. Not only does Bistro Vendome continuously beckon me back as one of my local favorites, but Rioja also boasts some of the great cuisine and culinary prowess of one of the finer Spanish culinary regions. With French and Spanish genres already checked of for Chef Jasinski (aka Denver's Chef of the Year), it only seemed like a natural progression to present a German 'bier haus' style concept for Denver to enjoy. Euclid Hall sits on Larimer and 14th, home of the deceased Martini Ranch. The name itself comes from the historical building that houses it, and has been converted back into what embraces the original architecture and style of old Lodo with a spin of modernity. And speaking of ancient art being translated into today, such is the basis of the concept: beer. Euclid Hall endows the dining scene with a celebration of the finest beers in the world. But with Denver boasting the title of "The Beer Capital of America", centerstage are also many of Denver's local craft and microbrew offerings. From Avery to New Belgium, old world to new world, Euclid's beer list more or less resembles a combination of wine catalog and periodic table. Also, make sure you double check the size of the bottle before you commit. 750 ml of 12.0% might put you under the table before you can get food on it. FYI- these larger options are meant to share, but I guess that depends on how long your week was. True to the bier haus concept, comraderie, libations, and sharing all come to life at Euclid. With a menu that encourages tasting in a small plate format, you'll find housemade sausages and pickles, a selection of poutines and sandwiches, and some finer points with oysters, foie gras, etc. It was like I had died and gone to Munich. It had been a while since all the cares in the world found a way to float off into my beer mug. But the comfort of the cuisine and artistry of fine dining melding together managed to do just that for my wife and I. Selection of house-pickled veggies: curried, bread and butter, hops infused, you name it. The adult version of oysters on the half, with a cucumber gin gimlet, and bloody mary granita. The suggested pairing with Avery Brewing's 'Reverend': a hoppy, medium-bodied ale. It complements well with the spicy, smoky nature of the oyster po'boy. The 'Hen of the Woods' poutine: Wisconsin cheese curds with a porcini gravy and wild mushrooms over house-cut fries. No hen about it. My only complaint is that this is a time-sensitive dish, and is not intended to be savored. Best shared, or devoured. Don't pass on the funnel cake bananas in a peanut butter caramel sauce, or you'll regret it. All in all I found myself comforted in the concept, and with well-executed team service it was also easy to unwind knowing that we were taken care of. Extra points to Chef Jen for saying hi. And an even finer treat for the end of the meal was the bill. You can actually splurge and get a good variety of cuisine here, without having to empty your pockets. So for your next night out, rally up the friends, crack open a few bottles and sip the night away. Dish It Up!